Have you ever wondered why your grout looks so dirty? You clean your tile regularly and yet over time that grout looks dingy and dirty and makes your whole floor look a little less clean. Grout is a porous material that allows dirt and grime to soak in - making it easily discolored. Dirty grout is also a frequent source of mold, mildew and bacteria. It's a challenge, but grout definitely needs to be cleaned and done properly or you risk ruining the grout. When it comes to cleaning your floors start with the mildest cleaning solution possible. Even then, test it in a hidden spot to make sure it doesn't stain or discolor your tile and grout. With that in mind, our tips are organized in order of mildest to strongest. One more caveat: always check with your tile manufacturer's warranty to make sure your cleaning options don't void the warranty. Plain water and a hard brush: You can buy brushes designed just for the purpose of cleaning grout. Spray warm water on the grout, scrub in a circular motion and let air dry. Vinegar, water and a hard brush: If water alone doesn't do the trick, try a solution of half white vinegar and warm water. Spray on the grout, let stand for five minutes and then scrub in a circular motion. Vinegar, water, baking soda and a hard brush: Need to boost the cleaning power? Make a paste of baking soda and water, spread it on the grout and then spray with the vinegar/water mixture. You can also add a little hydrogen peroxide to the baking soda paste and let the bubbles do some of the scrubbing for you. What about over the counter cleaners? Clorox bleach spray, OxyClean etc. are good options but carefully follow the manufacturer's directions and rinse with clean water. 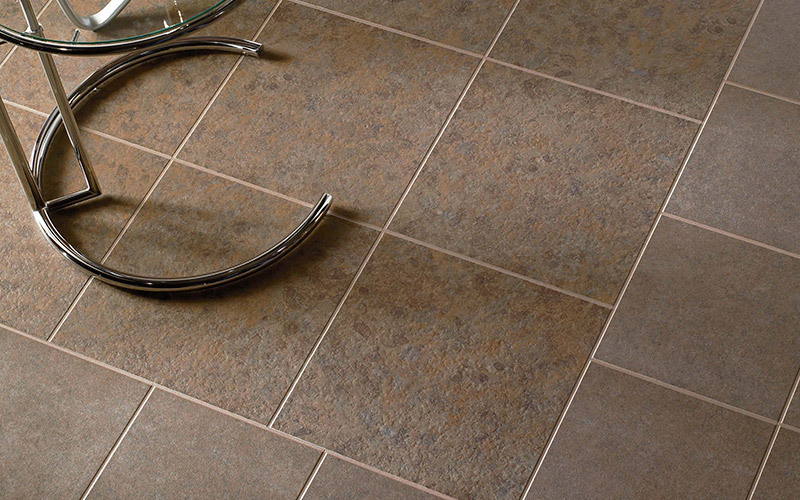 Talk to your flooring store about a color seal for your grout. That color seal can reduce the dirt that penetrates into the grout while also retaining the original color and look of the grout. Learn more recommended tile flooring maintenance tips in our free tile care guide.